After the welcome and notices, which included the Lamington Drive and the bowls challenge and which also called attention to the availability of large print TIS hymn books for those who need them during the service, the Call to Worship followed, as a conversation between Helen and the Congregation, affirming our life as a community, with our stories, food, wisdom, hope, laughter and pain shared as we travel the way of justice and truth, living a life of discovery as we journey home to God. (In my own case, with more than one or two hiccups along the way.) There's nothing like a church service to remind us of where we should be and how we have been losing our way in the previous week. Prayer A plea to be moulded by the source of our life into a holy community which will reveal the face of Christ. Hymn TIS 217 A prayer that the source of all love should dwell within us, and save us from our flawed, failing selves. A declaration that we know we can only be whole when God restores us. For this we are ever wondering and praising, overwhelmed by this unending blessing. When we sit back and think about our own behaviour, not to mention that of those who live lives deliberately causing carnage, I wonder why God persists loving us. But He does. Amazing! Prayer of Confession Acknowledging God's patience, and confessing our own neglect of seeking for God in the depth of our lives, because of our rush to get through the day, Helen prayed for us that God would teach us to trust Him so that we can learn to wait. I find that this can be frustrating, but answers come at the most unexpected times - often when we are focussing on the needs of others rather than on our own perceived needs. Words of Assurance "To all who turn to him, Christ says, 'Your sins are forgiven.' He also says, 'Come, follow me.' An amazing gift and invitation. I can never understand why I am distracted by trivialities from the wealth offered here. Revelation 21: 1 - 6 Delivered by Malcolm and well worth reading again, privately. The message is clear: all things are made new. The rules have changed. In fact it seems the rules are not so important now. "To the thirsty I will give water as a gift from the spring of the water of life." AS A GIFT. Hymn Songs for a Hopeful Church 24 "John, in the Spirit, saw the First and the Last"
John, in the Spirit, saw........so much. "O God, as you gave John the eyes to see...open our eyes and ears and hearts to know your wisdom, honour, glory, blessing, might." And forgive me for sometimes being so thick. Reflection God gives a vision. Helen recounted her experiences with her grandchildren during the previous few weeks and passed on to us the children's unwillingness for her to dwell on a question or to leave any uncertainty as answer. Their advice was, "Google it!" Early Christians didn't have Google, but did have dreams and visions. These dreams and visions were the result of their thinking about the questions that arose in their lives and of God intervening via the dreams and visions to provide them with solutions. These people didn't have any easy time. There was no freedom of worship. They were persecuted. Helen then proposed that, even so, they may have been better off than we are. We are so comfortable. There is no pressure on us to grapple with the depth of things. We have information in our heads but not in our hearts. We recite beliefs and repeat insights we have heard others put forward without grabbing hold of the substance of it all. We do not, because we don't have to, open our minds to the challenge and extent of our faith. The early church had to or they would not have held together. In the vision of Peter in the reading, God tells him to eat of any food but Peter initially refuses until God points out that everything He has created is acceptable. From this Peter learnt that God loves all people and was able to answer the criticism directed at him by the Jewish Christians in regard to his fraternizing with Gentiles and baptizing them. God is inclusive; He wants a relationship with all people. Demonstrating their willingness to open themselves to God's guiding hand the Jewish Christians saw the truth of Peter's explanation and praised God. They saw the bigger vision. They didn't know how it was going to work but they said, "Yes." to God's direction. In the second reading there is the vision of The New Jerusalem, the completion of creation. The relationship broken by the disobedience of people will be restored. This gives us hope. This will be the future. Helen then returned to the theme of our reciting our lives by rote and referred to a book of prayer she has been using. In this book people from all walks of life speak about the prayers that have given their lives impetus. In the book, the Rev. Marta Benavides from El Salvador, who was involved in humanitarian work during the civil war there, and who has set up refugee centres, nominated the Lord's Prayer as her most important and symbolic prayer. She calls it "Our Father and Mother Prayer" and recites it, not as a wish or request, but in recognition of all that has already been given to us by the Great Spirit. You give us each day our daily bread and I work to make sure we all enjoy it. You have forgiven us from the beginning. We have never had any debts, so no one owes me anything. You never lead us into temptation, but you give us a life that challenges us to grow in wisdom and grace, thus you do not have to deliver us from evil, for you are my and our light, if I so choose it, thus no evil is in my path and life. This is Marta's driving force. What are we grabbing onto? Where is our vision? Where is our energy? What can I do to bring about "Thy Kingdom Come"? Prayer God is all that is good and yet He is at home in us. Just as we have been loved, so that our old life is ended because God is making us new, we must love each other. That is what we are here for. We are to love each other, not just the people we like. Hymn TIS 432 "Christ is made the sure foundation" Christ is the cornerstone binding the church together and we are His hands, feet and heart in the task of making that happen. Freewill Offering "Loving God, we offer you these gifts, our money time and prayers, and place them in your hands. May they make a new world." Prayers for Others and The Lord's Prayer We were given a quiet space to consider our prayer and then Grahame, for us, prayed to God, our Holy Father and Mother, The Alpha and Omega, giving thanks for life's riches and then turned our attention to the people mourning all over the word because of the loss of life, not just in warfare but in incidents such as in the Boston bombing and the collapse of the workplace building in Dhaka. He prayed for forgiveness for our lack of progress to accept refugees or to attend to the needy. He asked that we should be shown our vision for MRUC and for blessings on our leaders. We then prayed The Lord's Prayer with new perception. Hymn TIS 224 "All hail the Power of Jesus' name" In every place, among every people, under every condition: "Crown Him Lord of all!" Praise God, from whom all grace flows forth! Praise Life, all creatures here on earth! Praise Light who guides us on our way! Praise Love who forms us day by day! Amen. Chrisanthia welcomed Dan, who was to lead the service for today and Dan, in turn proclaimed the Call to Worship inviting all present to attune their ears and hearts so as to hear God's voice in the service to follow. Hymn AHB 115 "Let us sing to the God of Salvation". A song of praise to the Lord who rescues us from our life of constantly falling short of what is intended for us; the Lord on whom we can depend always; the Lord whose Spirit reaches, even into the hidden places; the Lord who is our shepherd. Then an appeal that today will be the day we hear his message to each of us. Prayer of Adoration and Confession. For the congregation, Dan offered a prayer to our Creator and Saviour, God's Life-giving Spirit, to whom all praise and adoration are due. He prayed that we should receive God's Grace and in turn share that Grace with others around us. He acknowledged all our many transgressions of commission and omission, of which we are guilty each day and of not celebrating our lives and faith as we should. Dan prayed that we should be freed for joyful communion with our God and that we be renewed in our pursuit of God's will. Assurance of Forgiveness Dan spoke to us, assuring us of God's intention to make us whole, healing our torn hearts, encouraging us to rejoice in the forgiveness offered to us. Hymn AHB 371 "Dear Shepherd of your people, hear", asking God to make His presence known and to give us prayerful hearts: to heal our troubled spirits: to let us unburden ourselves of our cares and to offer prayers in faith: make us receptive in every way, so that we will grow in God's grace. Terry read to us, firstly from Psalm 23 and then John 10: 22 - 30. Both readings focus on the image of God as shepherd and the people as his flock. 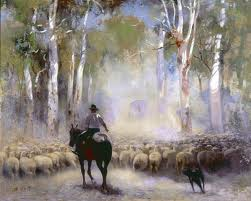 All the characteristics of the shepherd, well known to His contemporary audience, were and are relevant. The shepherd knows his sheep and they know him: the sheep know the voice of their shepherd and follow him, knowing that with him lies safety. In the OT reading there is also the sense that the shepherd will nourish his flock, seeing that they are fed and watered. The Sermon Dan began with the statement, "As Christians, we have the assurance that we belong to Jesus' flock, and as we are part of his flock, through Jesus we can have peace." When Jesus met his disciples, he greeted them with "Peace be with you" or more probably, the Hebrew equivalent, "Shalom", which is a greeting that can be used in many ways. It can simply mean peace be with you, but more often implies a sense wishing the person you are greeting, peace, wholeness, safety and general wellbeing. In the OT the priests were instructed to pray in terms of Aaron's blessing, "The Lord bless you and keep you, the Lord make his face to shine upon you and be gracious unto you, the Lord turn his face towards you and give you peace." so when Jesus gave the greeting "Shalom" or "Peace be with you" he disciples understood each as a shortened form of that blessing. Only God can grant that peace as a gift of the Holy Spirit, as part of the Good News that God wants us to share with others. In reference to Psalm 23, Dan proposed that God is just not a good shepherd as is one who cares for his flock, but that He protects us, guides us, and gives us peace. It doesn't mean that bad things won't happen but that God will guide us through them. In both the readings the image of God as a Good Shepherd sums up so much - it shows the absolute security Jesus' followers have through him- he will lay down his life for the flock. In the reading from John, we hear of the disbelief of the Pharisees and Scribes when Jesus says "I am the Good Shepherd, I know my sheep and my sheep know me". The Pharisees could not accept that Jesus was "one with the Father" and sought his death, in which he proved them wrong. As a result it is through the Holy Spirit we can know and truly feel God's peace. "The peace of God, which passes all understanding, keep your hearts and minds in the knowledge and love of God and of his son, Jesus Christ our Lord." "May the Lord of peace give you peace at all times and in all ways. The grace of our Lord Jesus be with you evermore." Hymn AHB 165 "What a friend we have in Jesus". Jesus who will answer all our cares. Who can lead us through all our problems - if we take them to him. After the notices and offering Dan led The Prayers of Intercession where he spoke of God giving us peace in times of trouble and times when we feel alone and asked that we would know God's peace and assurance. He then held before God MRUC, our leaders and the congregation and people close to the members of the congregation who are experiencing difficulties. He then prayed for the wider world: the people in Ethiopia, the groups giving aid, the people in Boston and the Uniting Church as we face the future. Hymn AHB 363 "Heart and heart unite together". " 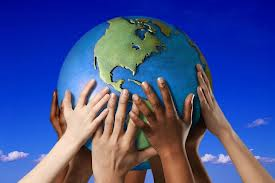 O thou gracious friend unite us"
Apologies for the lack of reflection in today’s blog. It has been caused by a combination of a very full programme and extreme tiredness. Sorry. Dermot, who was our minister for the day. He welcomed us with a Call to Worship, reminding us that even though humanity killed Jesus, Jesus did not turn away but reached out to those who harmed him or who were not strong enough to defend him. In this way Jesus reaches out to us and we are urged to respond to his call. The announcements for the day included one for next week's Pancake Day morning tea (April 21) and the upcoming Lamington Drive (May 18). There was also news of another bowls challenge. Hymn AHB 303 "Thine be the glory, risen, conquering Son". The next line is the crucial one for us: "endless is the victory thou o'er death hast won." Endless not only in time but also to the depths of all our flaws and weaknesses. The kid's message about sharing God's goodness to us was followed by another hymn. Hymn AHB 261 "Were you there when they crucified my Lord?" This was to be central to Dermot's message later in the service. What would our part in the crucifixion have been? We certainly were there, as every sort of goodness and evil was represented that day. What would have been our part? Prayer of Adoration, Confession and Supplication. Dermot confessed on our behalf that as a mixed bunch, all made in God's image and living in God's world we often failed to recognize Him around us and in others. He acknowledged, for us, that we needed to know who we are, and for needing relationship, our most fundamental one, with God. Dermot asked for forgiveness for us all for turning away from this and asked for help for us to open our hearts and minds. Reading John 21:1-9. Norma read the account of an everyday event. The disciples had gone fishing and it appeared to them that Jesus was on the shore. They ate fish with him. He could eat fish but they were unable to touch him. The mystery and confusion raised by this is typical of our lack of understanding of the whole God/ Humanity relationship. Knowledge is needed; as is understanding; but when it comes to the crunch, we have to step out in faith. In this reading we hear Peter challenged three times by Jesus with the question, "Do you love me?" Peter must have cringed with the memory of his three denials but Jesus made it clear that Peter was forgiven as he commissioned him to tend to the followers. Message Dermot referred again to the line of the hymn, "Were you there when they crucified my Lord?". He pointed out that the answer to this question brings into focus all we are and this moment when humanity collided with God happens again each day as we fail to live the lives we were created for. Dermot saw himself as one of the crowd - not doing anything to bring about that terrible event but not risking anything to stop it. Most of us would fit into this category. The thing is that when we are finally confronted with "Do you love me? ", what will be our answer? Jesus' responses to Peter in this reading and Thomas in last week's reading reveal His ability to understand our weaknesses and sometimes outright pathetic behaviour. In neither case was any criticism offered by Jesus, just acceptance indicating forgiveness. Dermot prayed, giving thanks for loving grace, asking that we should become what we should be through that grace. Hymn AHB 81 "the King of Love my Shepherd is". Knowing that this first line is true, the next, "I nothing lack if I am His" pretty much takes care of anything else. After the Offering, Prayers for the People were offered, asking for God's blessing and care for those known to us. Dermot prayed for our own need for deep relationships with others but most especially, with God. Hymn AHB 14 "Now thank we all our God, with hearts and hands and voices". Time to give thanks, knowing in faith, that God will live up to His promises and that we can rely on Him as long as we keep our eyes on Him. With that, Dermot blessed us and sent us out to look to our relationships with each other and with God, to grow us into the people we were created to be. The Call to Worship was a down to earth representation of how we all think and feel sometimes. "Sometimes believing, sometimes doubting,... sometimes weeping, sometimes laughing,...sometimes afraid, sometimes joyful...Whatever has happened to us, here we are welcome." The final response was the thing that gives us stability and hope..."This day and this house belong to God." Hymn TIS 380 "Yours be the glory" Chorus: "Yours be the Glory, risen, conquering Son, endless is the victory over death you've won." Endless- no matter what! That's what keeps us going through life's trials, our own weaknesses, the rampant greed and gobstopping corruption around us throughout the world. The Prayer of Confession "Let us open our lives to God and ask for his forgiveness and grace"
An opportunity to express our great sadness at ignoring the possibilities God puts before us - the times we choose to look away and hug what we see as offences against us, close to us, rather than look to Him and the Grace made freely to us through His great sacrifice and victory. And then the relief: "Your sins are forgiven...Come follow me." Hymn TIS 691 "Faith will not grow by words alone". In this hymn the reality we all know is expressed so clearly - "our faith must feel its way about, and live with question marks and doubt." But we can't just stand still - as the last verse points out, "Faith takes the little that we know, and calls for hope, and tells us: Go! Love and take courage come what may; Christ will be with us on the way." Scripture Reading John 20: 19-20, 24-28. Laurel read the account of Thomas and his doubts. We might have the same doubts as Thomas and we may be crippling ourselves by refusing to believe that God can heal our hurt. And He can't unless we ask. Unless we open ourselves to His work. This was followed by a first person narrative of the same account from Thomas' perspective delivered by Colin. At the end he says, "It was different for me - but maybe it's different for everyone. Jesus names each one of us, and invites us into his risen life." No one is excluded - no case too far gone. Reflection - "Scars reveal resurrection" Helen began by expressing a "soft spot" for Thomas and his doubts. 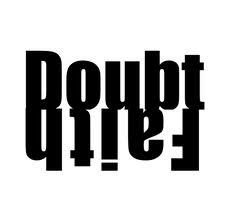 She said she thought that it wasn't so much a case of doubting God, as doubting his fellow disciples. "My Lord and my God". Helen then challenged us with the description of us as Easter People - those people experiencing the Risen Christ - here and now. This resurrection experience is not just light and happy - it comes out of the hard places of our lives. Just as women in labour have to endure and struggle to bring forth a new life, so this new spiritual life only grows out of struggle. But it is our core that gives us hope. Such hope that the disciples risked their lives to make it known. Wherever we are and whatever our struggles we should pray with Easter hope - then our expectations change. We know that there will be changes at Marsden Road in the near future - are we facing this as Easter People? Prayer "Hidden Christ, reveal yourself to us." This prayer was based on one be by Pat Bennett. A condensed version: Tear through the prejudices...shatter the arrogant assumptions...throw down the images we made of you...Then when we are naked and vulnerable,...send us out to encounter you afresh, in the resurrection garden of your world. Hymn TIS 649 "These things did Thomas" A plea that like Thomas, we too will believe. The Freewill Offering Thanking God for our blessings and comforts, we prayed that our offering be used to support others. Prayers for Others Delma thanked God for answered prayer and then prayed for peace in the world and the removal of tensions, especially those around North Korea. She prayed for the Uniting Church in Australia and then for individuals known to us. For God's honour and glory. This led into The Lord's Prayer. A prayer for needs, not for luxuries or excess. Communion Hymn "All the hungry, all the thirsty" A hymn for all seasons, so to speak. Whatever our sense of grief and loss. Whatever our need. God can meet it, abundantly. Communion Invitation An invitation for all to share in the gifts of the table. Christ calls our name. On our behalf, Helen then gave thanks for the signs of broken bread and poured out wine, asking that they may speak to us of the everyday made holy, of new life, dancing in our veins. She prayed that we might not cling to the past but answer joyfully to the calling of our names. 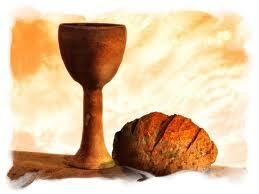 Prayer after Communion "Easter God, you have met us in bread and wine. Send us out into the world dancing with delight and with hallelujahs ringing in our hearts." In the breaking of bread and in prayers...In the telling of stories and in signs...In the sharing of resources and in justice...In this place and in this moment...A great mercy and sure hope. A new birth and a deep peace. A strong love and a rich blessing. God is sending us out in joy. Keeping this in our hearts and minds is so important, to keeping on track. "All God's people, praise your Maker, praise the one who called you here. All disciples, praise your Teacher, loving, leading, always near. 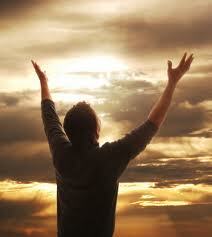 All you faithful, praise the Spirit, lifting every heart to pray. Praise the Holy One who gives us grace along the travelers' way.